You will remember that I recently hired an assistant for the pickiest old man on the planet. It wasn't easy, but I found a bright, young girl who was willing to put up with his ridiculous demands and his temper tantrums in exchange for a chance to get her career started. There were a few times that she showed up at my office door in tears after he shouted at her, but my co-workers and I gave her all the support we could to enable to her continue. He complained often and bitterly about her lack of experience (remember - he insisted that I hire someone young and fresh out of school because he wanted to start with a clean slate), but really there's no pleasing him. No one would have been good enough. Shortly after this new assistant settled in, the old fellow had a falling out with the owners of the company, and departed. For a few weeks it was up in the air as to whether or not he would return. I assigned the assistant to a filing project to keep her busy for a while. But it seems that he's well and truly gone. On one hand, I'm relieved. On the other hand, I feel badly for the assistant. I'm looking for a way to keep her employed. It would be a shame to lose her, now that she's trained and showing so much promise. I have a strategy to get her on board full-time (remember - he insisted that she work strictly part-time hours because he was too cheap to pay for our employee benefit plan). We'll see how that goes in the next few weeks. So. Canada has a new prime minister! That's pretty exciting. My feelings about Justin Trudeau are that he seems to be a nice guy who doesn't really have a clue about politics. I didn't personally vote for him. He said too many dumb things during his campaign, in between his (literal) juggling acts and photogenic smiles. But it did make me happy that he won; it's sweet that Canadians were willing to give an inexperienced nice guy a chance. Optimism won out over cynicism. Maybe he'll do okay. Only time will tell. We'd just all better hope that he has savvy advisors. The Toronto Blue Jays came this close to winning the World Series for the first time since 1993. The city was so psyched! Toronto and GO (Government of Ontario) buses had "Go Jays Go" signs in the windows or on their LED readouts. I'm not much of a sports fan, but it's fun when a home team is doing well and everyone gets into it. Too bad that the team didn't quite make it all the way this year. There is at least one actual blue jay that I see regularly on my way to work. It's super-pretty, and doesn't seem to mind what the baseball score is. So that's all good. I will enjoy its company... (*checks Wikipedia to determine its migratory patterns - apparently none*) all year round, if I'm lucky, maybe even into hockey season. That's it for the news tonight. Tune in next week for more. So your prime minister literally juggles?? I'll have to check this out. I was rooting for the Jays. I'm not a baseball fan really but I know a lot of Canadians and so I thought I would throw my support towards them. I've thought of you as I've heard reports of the PM & the baseball! Blue jays are pretty birds, but a bit noisy. Hope you can keep the new assistant on, because it sounds like the rest of you like her as a coworker! I'll have to second Gia's comment re: baseball/boring. And lest you feel too bad about the 'Jays not making it, remember the woeful Cubs. LOL at the Cubs, LOL hard! 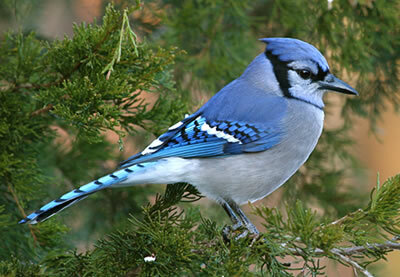 I have never seen a close up picture of a blue jay before and I must say this is a beautiful little fellow. I am sorry for the poor assistant, and I suspect she must be a coping sort of girl through coping with the nasty old codger! So hopefully you'll find her something else to do. That's nice of you to keep her working. I feel bad for your assistant, but kind of glad the old codger guy is gone. I think he was kind of a ... fly in the ointment, so to speak. Hopefully something will be found for this girl - brave soul, apparently, being willing to take that other man on! I love your Blue Jay pic! They're such beautiful birds! Bossy though. I once watched one try to screech a train to death for causing the branch its nest was on to sway in the breeze it caused going past. Funny stuff to see! sounds like a very good thing for that assistant to have you in her corner. I've seen a few temps who transitioned very well into permanent positions. Let's hope this works out too. In re: to the new P.M. who is a political newbie. Sometimes people want a newbie with no experience, just so they can say, "Hey, he's one of us." However, be careful what you wish for.